PARABEN Free ! Net 200 ml. Nourishing lotion helps to keep skin moisture, Enrich with the essence of Coconut oil, Sun flower Seed oil and shea butter, Enhance Firming and shiny skin. Vitamin B3 helps for brighen and delicate skin. Item condition : Brand-new, unused, unopened. Ingredient : Water, Glycerin, Cocos Nucifera(Coconut) Oil, Cyclomethicone, Myristyl Propionate, Helianthus Annuus(Sunflower)Seed oil, Ceto-Stearyl Alcohol, Cetyl Acohol, Glyceryl Stearate, Niacinamide, PEG-100 Stearate, Perfume Butyrospermum Parkii(Shea Butter), Sodium Polyacryloyldimethyl Taurate, Hydrogenated Polydecene, DMDM Hydantoin, Trideceth-10. Indication : Apply daily every morning and evening or as indulge. Net Weight : 200 ml. We offer a primer on parabens: what they are, what health and safety professionals say about them and which beauty products are made without them. Whether perusing the beauty and personal care products at Target or Whole Foods or shopping online at Sephora, consumers are increasingly encountering the phrase "paraben-free." What exactly does paraben-free mean, and why might it matter? We take a closer look — including sussing out pretty makeup products that are paraben-free. Parabens are the most widely used preservatives in cosmetics and personal care products such as soap, moisturizers, shaving cream and underarm deodorant, according to the Food and Drug Administration. To get a bit science-y, parabens are esters (a compound formed from acid and alcohol) of p-hydroxybenzoic acid. The FDA says the most common are methylparaben, propylparaben and butylparaben. Companies use parabens to extend the shelf life of products and prevent growth of bacteria and fungi in, for instance, face cream. And that's good, right? Mold is essential to blue cheese, but who wants to smear her face with it? But some think that parabens may be linked to breast cancer and fertility issues. A 2004 study by Dr. Philippa Darbre published in the Journal of Applied Toxicology found parabens in breast tumors. However, the FDA states in its official post on parabens that "the study did not show that parabens cause cancer." The "FDA believes that at the present time there is no reason for consumers to be concerned about the use of cosmetics containing parabens," the post says. A 2008 opinion on parabens from the European Commission's Scientific Committee on Consumer Products states that "methyl paraben and ethyl paraben are not subjects of concern," but that "the safety assessment of propyl and butyl paraben cannot be finalized yet." Rebecca Sutton, a scientist at the Environmental Working Group, a nonprofit advocacy organization, says her group is most concerned about propyl and butyl paraben too. But even though she says that parabens may disrupt hormones or mimic estrogen (which is thought to promote breast cancer in some women), "You certainly don't want parabens to be pulled out and a more dangerous preservative to be put in," such as one that releases formaldehyde. "Sometimes cosmetic companies might jump on the paraben-free bandwagon without really doing a proper assessment of … the safer preservatives that they ought to be adding." In fact, she says, "It's difficult to declare a preservative 'safe.' … We have limited data to evaluate. We've been unable to create a list of safer preservatives at this time based on existing publicly available scientific literature." So there isn't a consensus on whether parabens are safe. Dr. Wilma Bergfeld, chairwoman of the Cosmetic Ingredient Review panel, an independent body established by the industry that shares findings with the FDA, says the panel is monitoring the scientific literature and will review the safety of parabens again as new studies become available. No matter the level of concern, "The number of paraben-free items has increased dramatically," confirmed Jeremiah McElwee, a senior coordinator for Whole Foods Market. A Target spokesman also said there has been an increased demand for natural and organic beauty options. Horst Rechelbacher, the founder of Aveda who sold the company to Estee Lauder in 1997, has a newer company, Intelligent Nutrients, that is committed to certified, organic health and beauty products. All products that are certified organic by the U.S. Department of Agriculture's National Organic Program are paraben-free. But remember that all "natural" and "organic" labels aren't created equal. Look for the USDA's organic seal. Former model and makeup maven Josie Maran launched her eponymous makeup line with the tagline "luxury with a conscience" — and for her, that means no parabens, among other things. "I come from a family of cancer," Maran says. "My mom has a chronic illness, so my whole life we didn't have chemicals in our house and we didn't have a microwave and we were just very conscious of natural ingredients and natural fibers. … Growing up with alternatives helped me think out of the box. "I couldn't find anything out there where you were able to get high-performing, healthy cosmetics," Maran says. When she created her line, "Of course, paraben was the No. 1 ingredient to go." Instead of parabens, Josie Maran Cosmetics uses ingredients such as ethylhexylglycerin, which is plant-derived. Phenoxyethanol, another alternative to parabens, is a naturally derived ether alcohol used in small concentrations in Maran formulas. 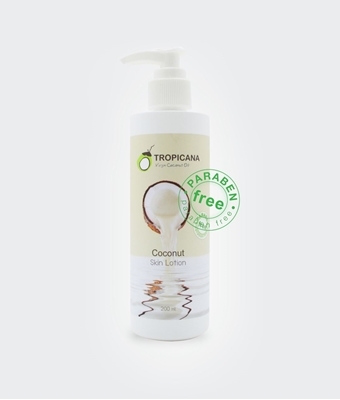 Tropicana Coconut Oil SKIN LOTION.